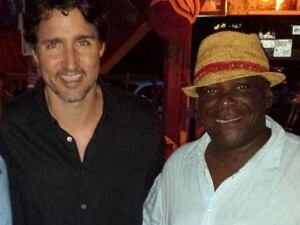 One of the suspects, source saying his name is Otto from Saint Kitts. COLE BAY–Two men stormed into Scotiabank at Simpson Bay Yacht Club on Friday morning just after 8:30am, although four persons had apparently been involved. Immediately several police patrols were sent to investigate what had taken place. At the bank the investigating officers learnt that the suspects gained access to the bank and while threatening everyone in the bank stole an undisclosed amount of cash. Off duty police officers who were also following the messages from the dispatch center also got involved in the search for the vehicles and the suspects involved in the robbery. 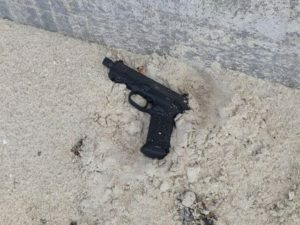 Shortly after one of the suspect vehicles, a silver colored Hyundai Accent without any license plate, was spotted by police driving through Simpson Bay. A high speed chase immediately followed at which time the suspects to abandon the vehicle and took off on foot. 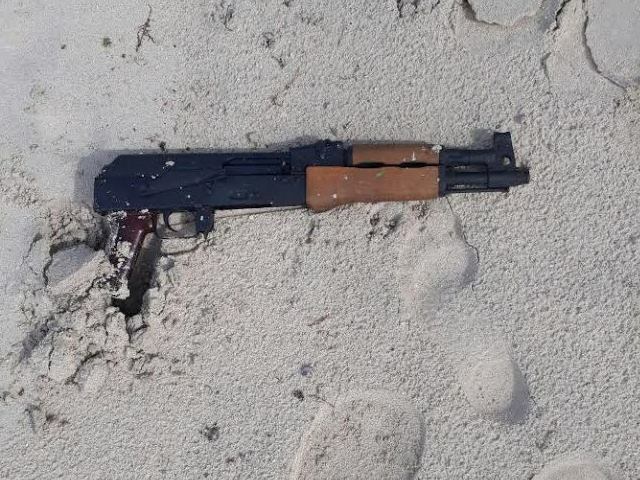 A foot chase followed on the Simpson Bay Beach at which time one of the suspects pulled high powered assault rifle from under his shirt and aimed it at the officer in pursuit. This left the officer no other choice that to fire directly at the suspect. The suspect dropped his weapon and continued to flee but had to stop because he had been shot. The suspect was immediately arrested. While fleeing from police the suspects also dropped a .45 caliber handgun. The rifle that the suspect had in his possession was identified as an AK-47. Both weapons were confiscated for further investigation. 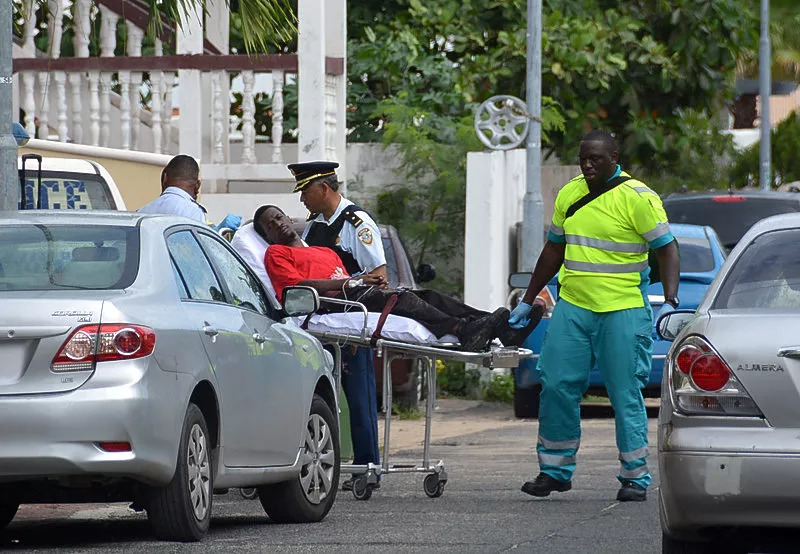 The suspect in this case was treated on the scene by paramedics and then transported to the Sint Maarten Medical Center for further treatment. The search for the other suspects turned into a massive operation in the Simpson Bay and Cole Bay areas consisting of police patrols, Custom Department, Coast Guard and the Gendarmes on the French. Due to the great working cooperation between these departments within less than a half an hour three other suspects were arrested in this case. During these arrests a bag containing a large amount of cash that was stolen from the bank was found and confiscated for further investigation. The police chief Carl John is very proud and commends his police officers for a job well done and demonstrating their level of professionalism. The police chief also thanks all other organizations that were involved in the operation for their tremendous input and is looking forward in taking the working cooperation to the highest level. The investigation continues. SIMPSON BAY – On Friday, June 9, Police shot a man in his arm after the man attempted to flee, failing to rob Scotiabank in Simpson Bay just after the bank had opened. 721news understands that 4 men tried to get through the double security door, but were unsuccessful. Police shot one of the four suspects, and another injured himself when he tried to escape the police, after a chase ensued in Simpson Bay. 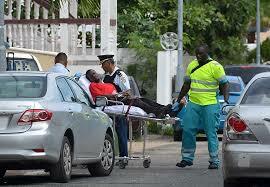 Reliable sources told 721news that the suspect that was shot has the last name “Otto” and is reportedly from St. Kitts. He is well known by police. During the chase, the same suspect had a machine gun in his possession, but quickly disposed of it after multiple gunshots were fired at him by the police officers. Police are still present in Simpson Bay as they are searching for more evidence.